I just discovered the usb cable that allows me to connect the cellular phone to the computer, so I am going through the pictures I have taken. The end result is that I am about to subject you to several pictures I have taken in the last six months or so. I assume that I am Herd because "I am legion" :-) This gets really funny when taken out of context. Click on the link to see, it is a Tube of Vodka. Instant Liven Transplant is required after consuming this. Do you need an introduction? I gave my IoC talk, and I got some good feedback. I have a hard time evaluating myself in this matter, there was a lot more power point that I usually like, and not enough code. I did get some involvement from the crowd, including some fairly interesting quetsions. I'll wait to get the official feedbacks. I also took part in a couple of panels, and just because I could, some OSS work when I had free time. I liked the irony :-). I'm dead tired, so this is probably going to be it today, to everyone that mailed me with patches, bugs, etc. I saw it, but I probably won't respond until the weekend. I am leaving for my IoC talk in the Microsoft Academy. I am sorry, but I cant read this. I can't even understand what this is meant to do. Now, I am the first to admit that my knowledge of Linq is weak at best, but still... Assume that I have a bug in such a code, how do I debug it? That is a much bigger concern to me, I am not worried about learning the new stuff, I am worried about what I need to do when they break. I have some experiance in debugging applications via Reflector, and that is not nice. Especially if the compiler is doing funky magic and you are left reading the IL. Looks like Ben Scheirman have found the big secret. Just one question, what is this picture or? 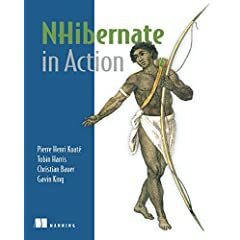 Aside from that, I can say that Hibernate in Action is a the best for anyone developing NHibernate. With the advent of NHibernate in Action, it is going to be even easier (no need to mentally translate from Java and EJBs anymore). I am looking forward to July 1th, when this book is coming out. Since I am giving a talk, I also have access to all the presentations ahead of time, and I spent some time going through them. Some people has clearly spent a lot of time trying to turn Power Point into Maya 3D. Anyway, I am seeing some really cool stuff there, things that make me want to start coding. I am giving a talk and participating in two panels, so I probably won't be able to see the talks (will have to wait for the videos), but it certainly makes sure that I would need some spare time after this is over to go over some of those talks. I started to get errors like this recently, and the whole debugging experiance has gone to the toilet ever since. Specifically, it looks like it is not able to do break on exception now. And I can't figure out what it the issue. It happens just when I am using TestDriven.Net, and not when I am attach to a different process. Right now it seems to have fixed itself, but it drove me mad. Phil Haack has a post On Hiring Bloggers and Open Source Developers. I guess that I have no choice but to +1. And if you get the joke, I would like to hire you. * That is a skill that you need to have. If you are searching for Reversing a String in C# and you manages to go to the only example I C in the page, that is a major minor point.